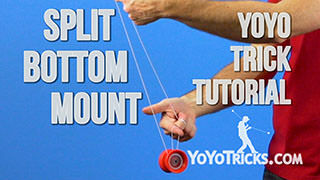 One-and-a-half Side-mount yoyo trick video. 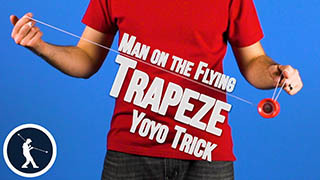 This trick is one of your basic mounts, but unlike the rest of the basic mounts where you land the yoyo on top of the string like the trapeze or double or nothing, or even man on the flying trapeze and his brother, the 1.5 mount is different because you have to mount on the underside of the string and that adds a level of complication that just makes it a little bit more tricky to master. But, like all those other mounts, there is a lot of great tricks that are built on the 1.5 mount, so it is a good one to focus on and to learn. You just need to be a little bit more patient with yourself. But I will give you are many tips as I can. So when you are thinking about this mount at first the way that it is set up is kind of like the trapeze. 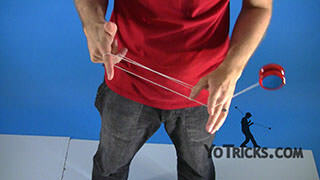 First you are going to go over your first finger on your opposite hand. 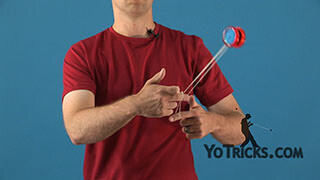 But you are going to let the yoyo continue to swing around so that it goes over the first finger on your yoyo hand. 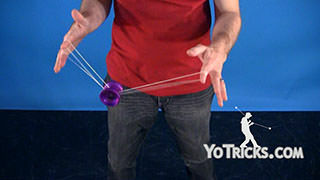 Then you are going to mount it on the underside of the string, the string coming off of the yoyo going over that first finger. 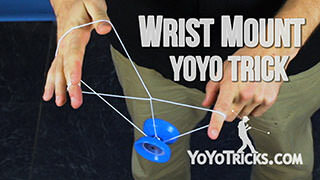 The first time that you are practicing this trick, it might be a little bit easier if instead of just going right into the mount, if you just position the string over your fingers like this, then swing the yoyo a little bit and rock it up into the mount like that. But, chances are, the first time that you actually hit the mount, this might happen. 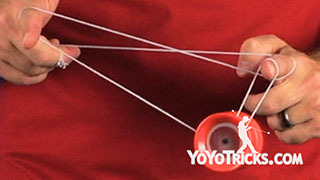 Where the string and the yoyo, they just bump into your finger and it kills the spin. 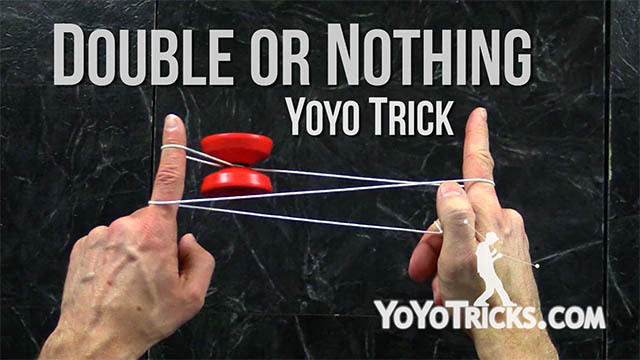 Chances are, the reason that is happening is because you do need to bring your hands together just a little bit as the yoyo is passing over the first finger of your yoyo hand. 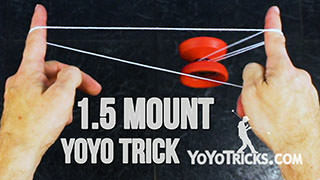 That will allow the string to cushion the yoyo as it goes over. It also gives it a little bit more room so it does not run into your finger. That motion is pretty subtle. 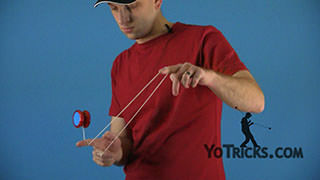 You are going to pretty much keep your yoyo hand still but you are going to move your opposite hand in just a tiny bit. 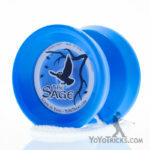 Again, just to cushion the yoyo as it hits the mount. Now, once you get comfortable with that and you are landing the mount a little bit more consistently, then you want to try to get the yoyo into the mount without stopping the motion of the yoyo. Again, it might be a little bit easier if instead of going right into it, if you slow the motion of the yoyo down a little bit and then pull it up into the mount. 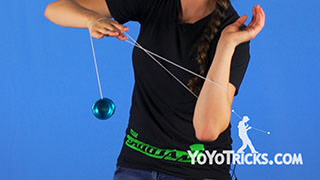 In order to do that, what you need to do is bring your hands together just a little bit as the yoyo goes over your yoyo hand. 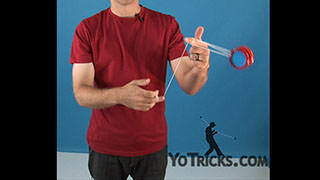 That will slow the yoyo down but you can see now it is too far away from my finger to mount the yoyo onto the string. 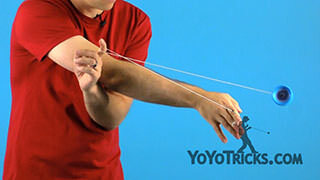 So what you need to do is pull your hands apart and that can get the yoyo close enough to this hand and it can get enough action on it so it will actually go over and land onto the string. 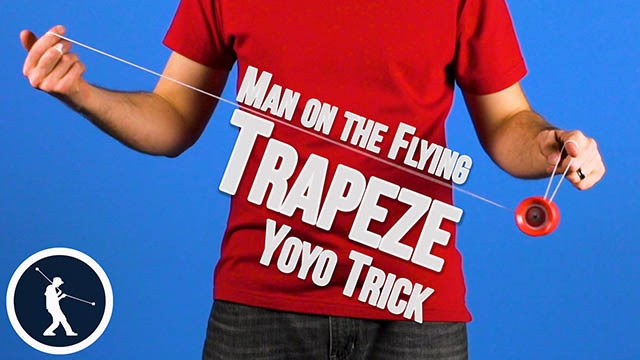 So, if you were watching me, you might have noticed that when I am doing that, I actually raise my opposite hand up a little bit relative to my yoyo hand. 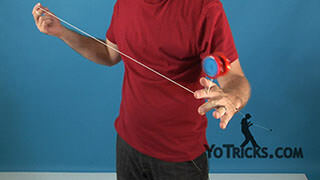 The reason I do that is because it gives me a little bit more control, and it also puts less pressure from the string on this first finger of my opposite hand so I do not get string burns quite as bad by pulling the yoyo up. Like I said, just slowing it down a little bit, it gives you a little bit more time to think about what you are doing to get the yoyo into the mount. So as you start practicing the mount this way, you may find that you start missing the trick a whole lot. 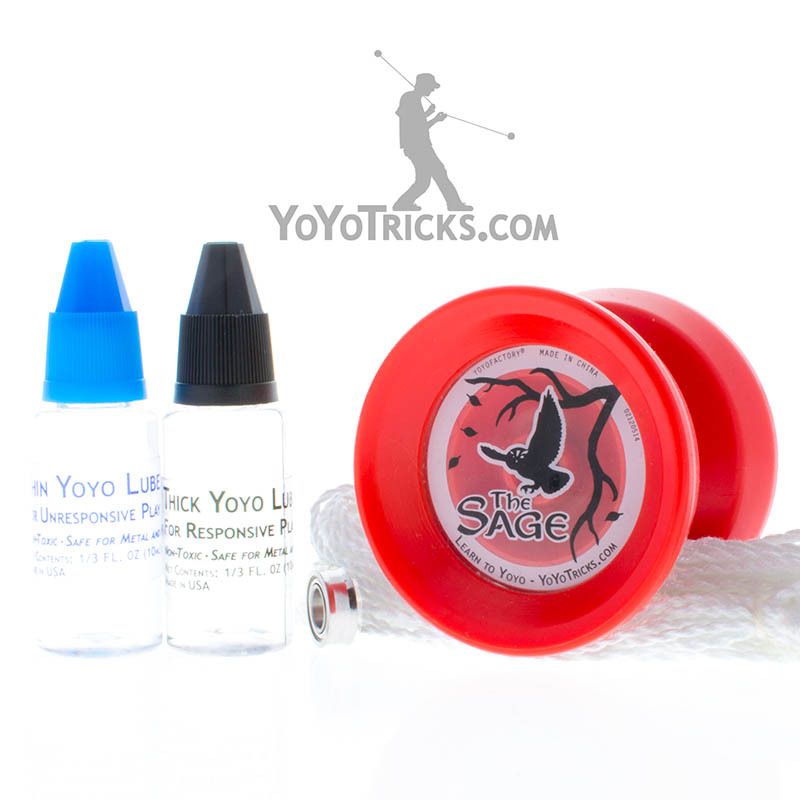 The first thing that you want to do to keep yourself from missing is make sure that you are keeping your yoyo hand perfectly still as you are practicing this. 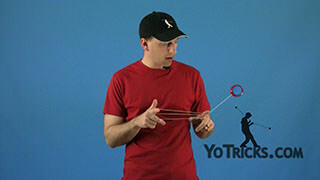 The second thing is you want to pay attention to if you are missing with the yoyo on the outside or on the inside. 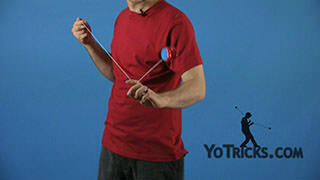 If you are missing with the yoyo passing on the outside, most likely that means that you are keeping your opposite hand too close to your body. 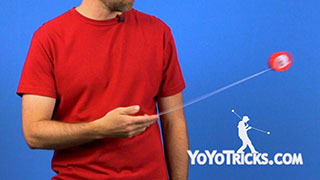 If you are missing the yoyo on the inside of the string, or if you are hitting this back string coming off of your yoyo hand, then that means that your opposite hand is too far forward. So, if you can keep everything perfectly straight, you will have a lot more success with this particular mount. Now, once you have that technique down, then you really just want to perfect the trick and that is where you just throw right into the mount. Everything that you have learned so far will definitely help, as well as other things that you have learned from other mounts. 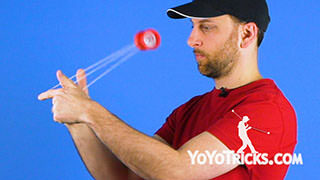 You definitely want to land the yoyo as close as you can to the first finger on your yoyo hand. You need to make sure that you are not too far forward or too far back with you opposite hand, and as long as your breakaway throw is straight, you should find yourself having success with this pretty quickly if you have mastered the two previous techniques that we have showed you. Now, one thing that I have been doing this whole time I have been doing this trick is I have been bending my yoyo finger in to create enough separation between the string so that I do not accidentally hit both strings. That is something you should get into a habit of doing, of course. But, for a lot of advanced tricks you need even more separation than that. So I am going to teach you one last technique that is just something that is kind of nice to have in your back pocket so when you get to those tricks, you are already used to it. 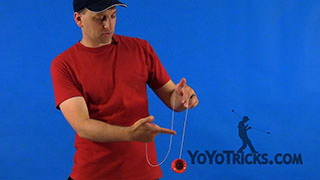 So what you want to do with this is as you throw yoyo, you want to grab the string coming off of your yoyo finger with your ring finger and your pinky on your yoyo hand. That way, you can see when you get into the mount, there is so much more distance between the front and the back string. Now, what I like to do is I like to grab the string as the yoyo is passing over my opposite hand, but before I fully get into the mount. It is, you can see it is really fast, and it is not something that you have to think about a whole lot, but it does take just a little bit more practice. So if while you are working on this particular version of the 1.5 mount, you just want to practice that every now and then, it will set you up for more advanced play. Like we said, the 1.5 mount, it is going to be a little bit more tricky than the rest of the mount that you have already learned, but this one is definitely worth it because a lot of the best tricks are built off of the 1.5 mount. So, be patient with yourself, and that is one and a half or the one point five mount.